It's time to start thinking about your holiday gifts if you haven't started already. I'm doing pretty good getting my gifts done in a timely manner. I wanted to do knitted gifts for some of my family members. My mother, grandmother, husband, son, and daughter are the recipients of knit wear this christmas season. I have my mother and grandmother done and am working on the others as we speak. I wanted to share one of the projects here on the blog. I loved the idea of making a cute little billed beanie for my grandma. It's done in a k1, p1 rib so it's super streatchy and keeps its shape beautifully. This is a GREAT gift item. This is super easy and knits up so fast as it uses super bulky yarn. It literally only took me 2 hours to make this, no lie. Thanks for visiting and happing knitting!! Well I have always wanted to design a bucket shaped hat inspired by my favorite shoes...Mary Janes. I have a pair that I love so very much and would wear them everyday if my husband didn't give me sideways glances. I came across some really pretty gingery colored yarn by Berroco. Their worsted "Comfort" line. I thought this would be a perfect hat for the fall. I thought the linen stitch would be perfect for this project. It makes a thick, sturdy, dense fabric without too much give. I'm also going to do a strap going across the front of the hat with some beautiful ceramic buttons. I have a horrible button fetish and I love ceramic. You can make them look like whatever your mind can conceive. I make them and plan to start selling a line of them on etsy (if I ever find the time). I made two different colored buttons and I swear I can't decide which ones to pick. Should I go safe and do the neutral colored buttons or should I go bold and do the turquoise?? I'm leaning towards the latter. I think it will really make a statement. I will update with a new pic once I get the hat done!! I'm really excited about this one. I'm writing the pattern as I go along. I don't know if this is the way that you're supposed to do it but it makes since to me. To make it a bit more visually appealing I'm also doing a little purl ridge in the pattern evey inch or so on the brim. This also helps with the decreases and keeps the texture pattern look nice and tidy. Ok. I'll stop rambling on and get back to work. I'd love to have this done before the weekend is over!! With these cute little bowls by Brett Bara! She has a wonderful new book out called "Sewing In A Straight Line". I absolutely love the book! So so many pretty and EASY projects in it! And ALL of them are sewn in a straight line! How much easier can you get? You can view a free video tutorial for this project at her blog right here!! I hope to be able to make these soon but I don't have any more fusible interfacing (I ran out!). So I have to make a Hobby Lobby run hopefully today or maybe Monday before I have class. But I had to show you all my new crush!! I'll post pictures of mine soon!! Well today I finished enrolling in college. I'm officially a college student and officially freaking out. I'm a 30 something stay at home mom going to college. I felt so old walking around campus today. So many young people. I'm so scared and so excited. I've decided to go back to school for radiology. I know medical is the way to go as far as a carreer choice but I am not the nurse type. Can't do it. But radiology is something that I'm actually really really interested in. There's so much to remember. I'm worried I won't have proper study habits so I'm takig a class to help me with that. I also have to take a few 0 level classes just to be able to take the regular classes. I only have 2 of those to take (I think) so I'm going to get those done asap. I know I have a long road ahead of me and I know it's going to be a whole lotta work and studying. But I'm sure looking forward to the journey. So keep me in your prayers!! I need ALL of them!! I fell in love with this yarn (Naturally Caron- Spa) and thought it would knit up beautifully. It's DK/light worsted weight. It's an acrylic/ bamboo blend and it has a lovely sheen and drape. I bought a few different colors and here's the first project I made with it. I thought I'd share the pattern here for all you nifty knitters!! It's a really really easy pattern and it knits up pretty quickly. I added a pom pom on the end of mine using a medium sized pom pom maker. and it's so warm and soft. I really like this yarn a lot. I will be making many more projects with it. You can get this yarn at Hobby Lobby. If you don't have a Hobby Lobby near where you live, you can find this at NaturallyCaron.com. I love the creative process so much. 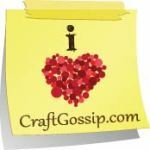 This blog is dedicated to my love of all things crafty, artsy fartsy, colorful and creative. I dabble in just about everything. Knitting and crocheting, jewelry making, working with polymer clay and ceramics, making organic soap and other various bath and body products, painting, graphic design and photography, cooking, baking and whatever else may come to mind. I just love it so much. I hope you find this blog an everyday read. It will chaulk full of tutorials, recipies, fun web finds and colorful inspritation of all kinds. I'm so excited to share my thoughts and creativity with you!! Thanks so much for stopping by.